And so, this year’s tale of the Christmas Bat comes to an end – with a little tease for what you guys can expect next year! (Careful readers may find that hooded figure in the last panel… familiar.) Sorry it took so long to get these Christmas Bat episodes out. These big strips take a long time to do; I don’t think they would’ve been possible to finish had I still been occupied by a full-time job, so this was way fun for me. Hope you dug ’em! Next week we’ll be back to our regular shenanigans with jefbot, which will actually come as a nice little break after working on the Bat strips. And after that – we might just get to the new, big storyline! Fingers crossed. thanks for the compliments, dj! makes me happy you liked the strips. also happy the Christmas Bat can still terrify after all these years. i promise to make next year’s installment even more terrifying. Could that be Gustav van Drom? I don’t know, but his little hat reminds me of the one from L.A.W.L.S. Now there’s an interesting end. Hopefully we will remember the Christmas bat a bit sooner this year . Anyway, How has everyone been doing? for this year’s bat storyline, i’ll have to start extra early, Fijiman! I’ll make a note on my calendar to remind you near the end of November. What? C’thulu? Lol. XmasBat dies next year? Replacement should be the rodent JB keeps. He is awesome. woo! gotta watch your step around guys with small hats, DAS! I’m hoping C’thulu is in the Pacific Rim. I would like to see that. I do hope Christmas Bat gets to fight C’thulu though. Epicness Overload. duuuuude. that’d be awesome if C’thulu makes an appearance in PR, ROM! and so Guillermo del Toro, especially since he was once attached to direct At the Mountains of Madness a while back. and we’ll see if the Christmas Bat tangles with C’thulu next year. no promises! There is nothing to be feared except the fear itself. but i’m afraid of the fear of fearing the fear, Maryz! Sweet, we have an epic tale going on here. Nicely done. thanks, TPC! to be continued! Now that I’ve seen it, it’s obvious that the only effective weapon against the Christmas Bat would be tinsel cannons. Good Morning Botiverse! I hope everyone is having an amazing new year! C’thulu vs the Christmas Bat. It was only a matter of time. Mysterious top hat man, kinda looks like Dr. Nefarious. ’tis true, 52pickup, but who will win!!? unless C’thulu has some ribbon cannons, i wouldn’t count the Christmas Bat out! Jeff, yours and Pixie’s attitudes never fail to make me smile. Keep on truckin’, you crazy kids! and: ooh, sweeeeet!!! thanks for letting me know JEFbot looks good on the Nexus 7! been thinking about picking one up, and now i can justify the purchase. heheh. Closure! I LOVE IT!!! So well done. Beautiful story and artwork! Once again the day is saved by… Santa Claus! Boy, we narrowly averted disaster with that one. 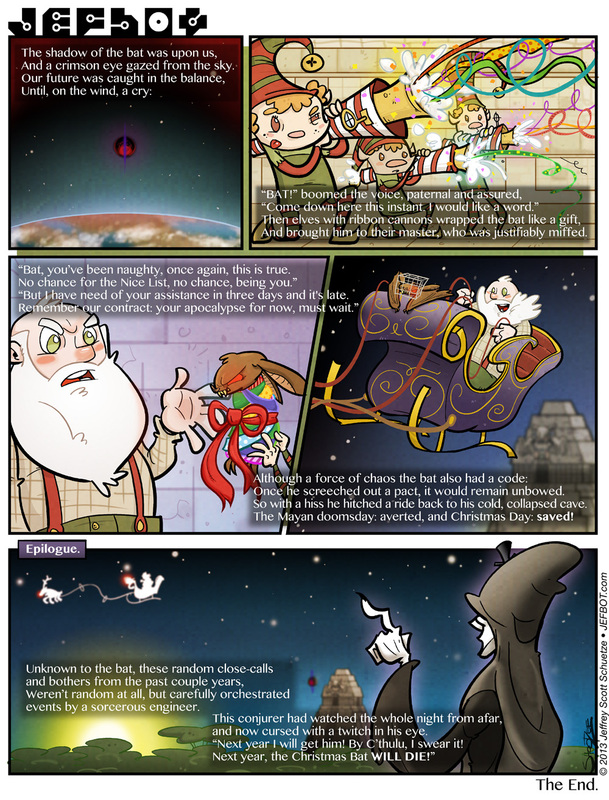 Had I realized the Christmas Bat had a role in the Mayan doomsday prophesy, I would have been much more worried. Whew! yep, good ol’ Santa saves the day again, Shanna! hopefully he’ll be around next year when the Christmas Bat gets into his biggest scrape yet. Me thinks this was the best Christmas Bat Saga, yet!